TOKYO - Nikon Corporation is pleased to announce the release of three new COOLPIX P-series models, the P600, P530, and P340. The COOLPIX P series is a line of multi-functional, high-performance compact digital cameras that enable full-scale photography. The P600 and P530 are compact models equipped with high zoom-ratio lenses that support capture of a wide variety of scenes with a single camera. 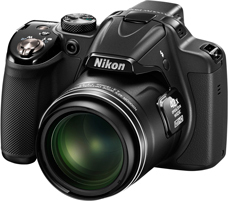 Despite being equipped with a 60x (up to 120x*1 with Dynamic Fine Zoom) optical zoom NIKKOR lens offering the highest zoom ratio in COOLPIX history with coverage of a broad range of angles of view, from the wide-angle 24mm to super-telephoto 1440mm (equivalent focal lengths in 35mm  format), the P600 is very compact. The NIKKOR lens built into the P600 is also the first COOLPIX lens for which a super ED lens element has been adopted for superior image quality. The P530 is equipped with a 42x (up to 84x*1 with Dynamic Fine Zoom) optical zoom NIKKOR lens that covers a broad range of angles of view from wide-angle 24mm to super-telephoto 1000mm (equivalent focal lengths in 35mm  format), and a high-resolution, 3-inch, approximately 921k-dot TFT LCD monitor with wide viewing angle. New scene modes, Moon and Bird-watching, have been added to both of these models, allowing users to easily enjoy super-telephoto photography. In addition, these cameras are equipped with a high-performance lens-shift vibration reduction (VR) function that offers camera shake compensation equivalent to a shutter speed 3.5-stops*2 faster and an Active option for effective reduction of blur caused by camera shake with recording of still images and movies. Offering faster AF and a shorter shooting time lag, these cameras ensure capture of the desired moment with quick and nimble focusing. On its own, each of these compact cameras is packed with advanced functions that support photography of a wide variety of scenes, from super-telephoto to wide-angle and macro photography. The P340 features a simple, refined design, and its combination of a fast lens with a maximum aperture of f/1.8 and large, 1/1.7-inch backside illumination CMOS sensor achieves superior rendering characteristics. It is equipped with a 5x (up to 10x*1 with Dynamic Fine Zoom) optical zoom NIKKOR lens that covers the wide-angle 24mm to telephoto 120mm range of angles of view (equivalent focal lengths in 35mm  format) that also enables macro photography as close as 2 cm to the lens. It offers superior operation with adoption of a control ring around the lens barrel, to which a variety of functions can be assigned, and which can be used to fine-tune effects applied in scene modes and Special Effects mode. In addition, the P600 and P340 offer built-in Wi-Fi® that can be used to easily transfer photos to a smart device for sharing with others*3. This allows users to enjoy connecting with others through their photos after they are taken. *1At the maximum image size. *2Measured at approximately 350mm (equivalent in 35mm  format) in accordance with CIPA standards. *3The Wireless Mobile Utility app must first be installed on the smart device (the app can be downloaded free of charge from the smart device's app store), and Wi-Fi® connection settings must be applied before image transfer is possible. 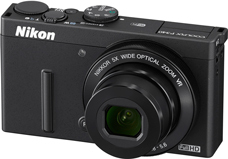 The 60x optical zoom NIKKOR lens built into the P600 offers an ultra-high zoom ratio that covers the wide-angle 24mm to super-telephoto 1440mm range of angles of view (equivalent focal lengths in 35mm  format). In addition, it is equipped with Dynamic Fine Zoom, which enables 120x* zoom with which resolution is preserved in the digital zoom range, and also supports macro photography as close as 1 cm to the lens. This model supports capture of a wide variety of scenes, from super-telephoto to wide-angle and macro photography. What's more, two new scene modes—Moon and Bird-watching—have been added. By simply selecting one of these scene modes, the camera automatically focuses and applies optimal shooting settings, including shutter speed and aperture, allowing users to easily enjoy super-telephoto photography of scenes such as the moon and wild birds with hand-held shooting. *At the maximum image size. Photos captured with high-power zoom applied are often blurred by camera shake. The P600, however, is equipped with a high-performance lens-shift vibration reduction (VR) function that offers camera shake compensation equivalent to a shutter speed 3.5-stops* faster, enabling worry-free shooting even with super-telephoto photography. In addition, Active mode effectively reduces the effects of greater camera shake and makes framing images easier for sharp, clear still images and movies, whether photographing landscapes from a moving vehicle or recording movies while walking. *Measured at approximately 350mm (equivalent in 35mm  format) in accordance with CIPA standards. For the first time ever, a super ED lens element has been adopted for a lens built into a COOLPIX camera. Super ED lens elements have long been used in Nikon digital SLR cameras. A single super ED lens element enables superior aberration correction performance for images exhibiting excellent resolution, even when captured at high zoom ratios. In addition, adoption of a super ED lens element helps to keep the camera body compact as superior image-formation performance can be achieved, even with high-power zoom, without increasing the size of the lens barrel. The P600 is equipped with a 3-inch, high-resolution approximately 921k-dot RGBW vari-angle TFT LCD monitor with wide viewing angle. Adoption of a vari-angle monitor enables flexible shooting from any angle, whether low or high. The camera is also equipped with 0.2-inch, approximately 201k-dot electronic viewfinder (EVF) that can be used to frame images with shooting. In addition, the P600 offers a number of features that make full-scale photography more enjoyable, including an Fn (function) button to which a frequently used shooting setting, such as Image Quality, Image Size, White Balance, ISO Sensitivity, or AF Area Mode, can be assigned, as well as a side zoom control for zooming in and out with less camera shake (the side zoom control can also be used to focus manually). The built-in Wi-Fi® function can be used to transfer photos* to a smart device over a wireless connection as soon as they are taken. Photos taken with this digital camera can be easily shared with family and friends, or uploaded to blogs or social networking service (SNS) sites. In addition, the display on a smartphone, tablet, or other smart device can be used to frame images and control shooting remotely. This is very convenient when taking group photos and the like in which the user is included. With remote shooting, the self-timer, zoom, and shooting information are also displayed on the smart device screen. *The Wireless Mobile Utility app must first be installed on the smart device (the app can be downloaded free of charge from the smart device's app store), and Wi-Fi® connection settings must be applied before image transfer is possible. Charging time can be significantly reduced with high-speed charging using the Charging AC Adapter EH-71P/EH-71PCH. Shooting and playback operations can also be performed while the battery is charging. The 42x optical zoom NIKKOR lens built into the P530 offers an ultra-high zoom ratio that covers the wide-angle 24mm to super-telephoto 1000mm range of angles of view (equivalent focal lengths in 35mm  format). In addition, it is equipped with Dynamic Fine Zoom, which enables approximately 84x* zoom with which resolution is preserved in the digital zoom range, and also supports macro photography as close as 1 cm to the lens. This model supports capture of a wide variety of scenes, from super-telephoto to wide-angle and macro photography. Photos captured with high-power zoom applied are often blurred by camera shake. The P530, however, is equipped with a high-performance lens-shift vibration reduction (VR) function that offers camera shake compensation equivalent to a shutter speed 3.5-stops* faster, enabling worry-free shooting even with super-telephoto photography. In addition, Active mode effectively reduces the effects of greater camera shake and makes framing images easier for sharp, clear still images and movies, whether photographing landscapes from a moving vehicle or recording movies while walking. The P530 is equipped with a 3-inch, approximately 921k-dot TFT LCD monitor with a wide viewing angle. This monitor offers a bright display with excellent detail and faithful color reproduction, and maintains its visibility even when viewed from an angle. The camera is also equipped with 0.2-inch, approximately 201k-dot electronic viewfinder (EVF) that can be used to frame images with shooting. This function supports manual focusing by highlighting areas that are in focus in white on the view through the lens displayed in the monitor and viewfinder. This enables more precise adjustment of the focus position for smoother focusing. As the view through the lens displayed in the monitor simulates exposure at current settings, users can preview resulting images with greater accuracy. The size of the focus area can be selected from Normal, Wide, and Spot. The ability to specify the size of the focus area makes for more flexible fine-tuning of focus in accordance with the size and position of the intended subject. 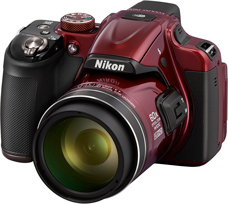 The cameras also offer four exposure modes—P, A, S, and M—that make mastering manual camera operations more fun, as well as COOLPIX Picture Control, which enables adjustment of imaging characteristics such as vividness and sharpening prior to shooting in accordance with the subject, shooting conditions, or photographic intent, Special Effects mode, which allows users to enjoy applying effects, such as those concerning color and contrast, to still images and movies before they are recorded, and Filter Effects that can be applied to still images already recorded. AF operation has been optimized and made faster for faster autofocusing and a shorter shooting time lag. Smooth focusing ensures stress-free shooting and certain capture of any photo opportunity. *At a setting of Continuous H with Image Quality set to Normal and Image Size set to 16M (4608 x 3456). The P340 is equipped with a NIKKOR lens that represents the accumulation of Nikon optical technologies and offers a fast maximum aperture of f/1.8. The camera is also equipped with a large, 1/1.7-inch backside illumination CMOS sensor, and is able to more effectively acquire light with an effective pixel count of 12.2-million pixels. The combination of fast lens and large CMOS sensor achieves superior resolution with excellent texture, definition, and a more three-dimensional feel. The P340 is equipped with a 5x optical zoom NIKKOR lens that covers a broad range of angles of view, from the wide-angle 24mm to the telephoto 120mm (equivalent focal lengths in 35mm  format). The lens also offers powerful support for macro photography with shooting as close as 2 cm to the lens. A seven-blade iris diaphragm makes capturing photos in which backgrounds are beautifully blurred possible. In addition, it is equipped with Dynamic Fine Zoom, which enables 10x* zoom with which resolution is preserved in the digital zoom range. Adoption of high refractive index lens element(s) and aspherical lens elements enables a slimmer lens barrel for a more compact camera body. This high level of performance makes for consistently sharp rendering from the center of the frame to frame edges. When the built-in neutral density (ND) filter is enabled, the amount of light that passes through the lens can be reduced to a degree equivalent to a three-stop reduction in shutter speed. This allows users to emphasize subject movement with slower shutter speeds, even in bright places or situations. Users can easily assign a function to the control ring adopted around the lens barrel and use the control ring to adjust that function's setting (in P, S, A, M, U and Auto shooting modes only). It can also be used to fine-tune effects applied in scene modes and Special Effects mode. The P340 also offers a command dial and rotary multi selector that can be used for independent control over primary shooting settings such as ISO sensitivity, shutter speed, and aperture setting. The Fn (function) button, to which a frequently used function can be assigned, and movie-record button, which enables movie recording at the touch of a button, also help to make P340 operation smoother and more natural. Photos captured with high-power zoom applied are often blurred by camera shake. The P340, however, is equipped with a high-performance lens-shift vibration reduction (VR) function that offers camera shake compensation equivalent to a shutter speed 3.5-stops* faster, enabling worry-free shooting even with super-telephoto photography. In addition, Active mode effectively reduces the effects of greater camera shake and makes framing images easier for sharp, clear still images and movies, whether photographing landscapes from a moving vehicle or recording movies while walking. *Measured at the maximum telephoto position. * The Wireless Mobile Utility app must first be installed on the smart device (the app can be downloaded free of charge from the smart device's app store), and Wi-Fi® connection settings must be applied before image transfer is possible. High-quality and smooth 50i/60i movies with stereo sound can easily be recorded by simply pressing the camera's movie-record button. What's more, the P340 offers a movie pause function, with which recording of a single movie file can be paused and then restarted (within 5 minutes), as well as the ability to save movie frames as still images while movies are being recorded. As movie frames can also be saved as still images and unwanted portions of movies can be eliminated with movie playback, users can save only the desired portion of movies for recording and editing of movies as intended. Autofocusing is initiated faster than with previous cameras, and has also been optimized for faster focusing and a shorter shooting time lag. Smooth focusing ensures stress-free shooting with certain capture of photo opportunities.